I wrote this piece for Blog and Log – the blog site that records outreach activities of the Institute of Integrative Biology and the School of Life Sciences at the University of Liverpool, to which I currently belong (for two & a bit more months). Several weeks ago, I had the opportunity* to talk, twice, about a topic related (slightly tenuously) to my research and very close to my heart. On the evening of Wednesday 19th September I stood on the stage at Leaf, facing the Ignite Liverpool crowd, to present on “The Three Ps”; and on Saturday 22nd September I stood on a soapbox in Sheffield’s busy shopping district, to shout about “Peanut butter, palm oil and peat; getting un-stuck in the mud” to a bunch of slightly bemused passers-by. They were quite different forums with which to share my knowledge and passion, but I learnt a good deal from preparing for and presenting at each. Here’s a quick low-down of each event, which might hopefully inspire you to get involved in the future. Ignite Liverpool is the brainchild of a community organisation that runs quarterly events, providing a platform on which anyone can talk for a whistle-stop five minutes about a subject they are passionate about. The challenge is to convey a coherent story in five minutes, in synchrony with the visuals on your 20 slides which flash up for five seconds in a continuous reel. I managed to mumble in time to the slides until the penultimate one, where my dialogue turned to dust! It was a fun experience though, and useful in considering how to design succinct propaganda. If you’d like to know more about the tale of The Three Ps, you can watch my performance here. I would recommend giving Ignite a go if you live in Liverpool, or any of the other cities where it’s held (e.g. Sheffield); it’s a great opportunity to practice your public speaking and communication skills on any topic of your choice, in front of a very supportive, slightly tipsy crowd. The most hilarious talk at the last event was entitled Any Colour you like, where all of the slides where shades of black! Soapbox Science proved a less well-polished, more chilled-out and slightly chillier event! The initiative was started eight years ago by two female Biologists, with the goal of creating a public outreach platform on which female scientists could promote their science, whilst simultaneously increasing the profile of women in the STEM sector. I chose to talk about the same issues on the soapbox as I did on the stage: a narrative around the prolific commodity, palm oil, which links our consumption behaviour in the UK to the draining and deforestation of peat swamp forests in Southeast Asia. Orang-utans, the people of the forest, were the protagonists, of course. As part of my PhD research (a few years ago now! ), I explored the long-term ecology and contemporary management of the coastal peat swamp forests of Sarawak, in Malaysian Borneo, and have since been monitoring their declining condition and the ever-expanding state of industrial oil palm plantations across the region. Though my Soapbox performance was not as succinct as I’d hoped (more prep required next time to catch the attention of a transient audience), I managed to have an interesting discussion with several members of the general public on topics of environmental sustainability and the RSPO. The conversation with one chap, as engaged as he was disillusioned, only concluded when we decided that capitalism needed to be scrapped. Unfortunately, I didn’t feel qualified to propose an alternative solution. I found both experiences hugely valuable, primarily because I gained some idea of the level of knowledge amongst the general public on some everyday consumer issues. People were less aware than I’d realised. To place your science into a ‘real world’ context, to understand how it might fit into the lives of your neighbours, and to learn how you can inspire people to care as you do, I would recommend standing up on as many platforms as you can. *The opportunity was created by me through signing up to two events without realising they were in the same week! I questioned my life choices many times when preparing for them into the wee hours of the morning …. though as per usual have no regrets, in retrospect. I’ve pasted our concerned correspondence below. This post was written by members of C-PEAT (Lydia Cole, Ian Lawson, Dave Beilman, Dan Charman and Zicheng Yu) to voice the group’s concern over the consequences of the recent extensive burning of Indonesia’s peatlands for science. C-PEAT (Carbon in Peat on Earth through Time) is a thematic group of PAGES (Past Global Changes), and had its inaugural meeting at Columbia University in New York, in October 2015. Many reports and commentaries concerning the recent fires in Indonesia, including here, have been published over the last twelve months. El Niño conditions, bringing drier weather to this part of Southeast Asia, in combination with extensive draining of peatlands, resulted in a tinder box that started burning in mid-August of 2015 and continued even as the world’s nations gathered at COP21 in Paris to discuss tools for sustainable forest management. The consequences of these fires for society, the economy and the environment are still being quantified. The areal extent of last year’s burning across Indonesia has been estimated to exceed 2.6 M ha (World Bank), with up to 90% of the subsequent haze resulting from peatland fires. Peat volume losses over such a large area are likely to represent, by analogy with the 1997 fires (Page et al., 2002), a globally-significant loss of stored carbon. While we share the widespread dismay at these social, economic and environmental consequences, we wish also to point out the loss to science represented by the apparently relentless destruction of Indonesia’s peatlands, a topic which was discussed at the inaugural PAGES Carbon in Peat on Earth through Time (C-PEAT) meeting last October. Peatlands, which store atmospheric carbon as partially decomposed organic matter, provide a rich diversity of palaeo-proxies that can be used to measure the effect of past climatic change and human activity on ecosystems. Akin to the loss of climate histories from disappearing glaciers worldwide (Savage, 2015), our library of environmental history in Indonesia is going up in smoke. The importance of understanding the past will only increase as we enter historically unprecedented climatic regimes and environmental states, for which the prehistoric palaeoenvironmental record is a key resource for insights and analogies. Page, S.E., Siegert, F., Rieley, J.O., Boehm, H-D.V., Jaya, A. & S. Limin. (2002) The amount of carbon released from peat and forest fires in Indonesia during 1997. Nature 420, 61-65. Savage, N. (2015) Glaciology: Climatology on thin ice. Nature 520, 395-397. I have just read this. The Malaysia Palm Oil Board (MPOB) is hooking up with the Sarawak Oil Palm Plantation Owners Association (SOPPOA) to figure out what is going wrong with palm oil production in Sarawak. 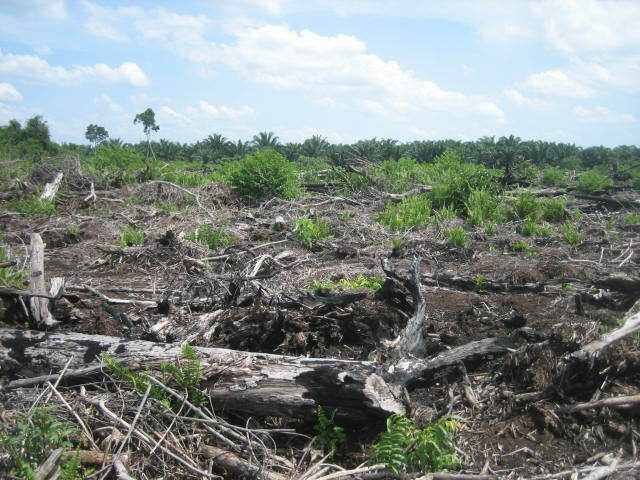 Amongst other issues, members of SOPPOA have been complaining of: “oil palm estates (having a) …. serious infestation of Tirabatha (a moth of the pest variety), particularly in the lower Baram and central coastal regions, poor fruit set, bunch failures, lower frond dessication and acid sulphate soil problems”. The lower Baram and coastal regions are mostly peatlands. Acid sulphate soils result from the draining, oxidation and resultant subsidence of peat, exposing the underlying acid sulphate soils. It’s not rocket science. MPOB, the oil palm research and management organisation in Malaysia (Government-funded and led) that directs the production of palm oil across the three States of Malaysia, will conduct the research and report to SOPPOA. SOPPOA is somewhat at MPOB’s mercy to suggest how farmers across the State of Sarawak can maximise yields and profit, especially from the coastal peatland zones, for which there is limited to zero knowledge on best management practices, from an optimum profit point of view. From an environmental point of view, I’m not sure there is a point of view. I wonder what MPOB will conclude. A deforested and drained tropical peatland in Borneo, with an approximately five year old oil palm plantation in the distance. Asia Pulp and Paper (APP) has decided to ‘immediately retire’ approximately 7,000 hectares of its acacia plantations in Indonesia, with the goal of restoring them to intact peat swamp forest and developing a peatland best management practice model. This is a bold move, forfeiting profits to comply with their Forest Conservation Policy (FCP). Just over a year ago, they proved to be conservation forerunners again, (loudly) announcing to ‘protect and restore’ one million hectares of forest. These come as welcome actions from APP, after it spent many years (and still is?) leading the deforestation frontier across Sumatra and Kalimantan, replacing hugely diverse ecosystems with monoculture plantations, and draining many a peatland along the way. As Wetlands International say, there’s still a long way to go before APP can claim to be conserving, rather than destroying peatlands. For example, how do they plan to rewet the peatlands? What species are they going to plant into the current monocultures, and when? How will they manage fire risk (heightened this year by ENSO) and potential flooding? What will be the likely carbon emissions under different restoration strategies? These are all important questions that researchers can help to answer. Members of the UK Tropical Peatland Working Group are certainly on the case (watch this space). But APP have given us a goal to hold them accountable to….and we must. More information on the restoration mission from Deltares, APP’s independent peat expert team, can be found here.